In an effort to make the web safer for all users, as of July 2018, all HTTP websites will be marked as “not secure” by Google. For years the company has slowly encouraged developers to make the switch to secure HTTPS websites. Here’s what the switch means for your business. According to a blog post by Chrome, their goal is to “move the web towards a secure HTTPS web by default.” The change will hopefully help users understand the Interweb better and the importance of Internet privacy and safety. At the top of your web browser, Chrome used to display a neutral information icon. But that has now been changed to a notification to the left of the address bar, with the latest version of Chrome 68. Secure HTTPS-encrypted sites will be marked with a green lock icon and the word “Secure”. HTTP, located at the front of a URL, stands for Hypertext Transfer Protocol. This is the protocol for which your information is sent from your browser, back to the website you are currently on. The communication between your computer and the site is sent unencrypted in plain text. This means that someone can easily see the information you’re sharing by tapping into the connection. The “S” at the end of HTTPS stands for secure, making it Hypertext Transfer Protocol Secure. 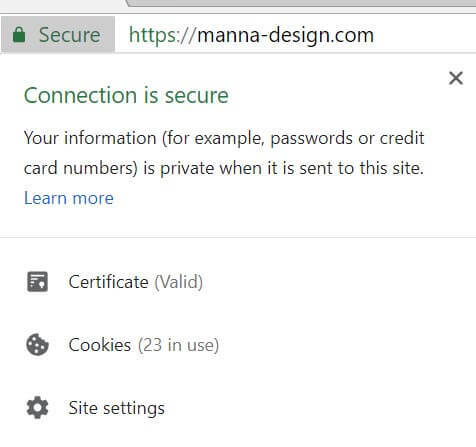 HTTPS websites use separate protocols called SSL, or Secure Socket Layer, and TLS, or Transport Layer Security, to communicate the information between your browser and the website. HTTPS websites user safe tunnels to transfer information back and forth. These connections are far more difficult for someone to hack into and steal your information. How Will This Change To Secure HTTPS Sites Affect My Website? Starting a few years ago, Google Search Engine down-ranks unencrypted websites, meaning your web page will display lower in search results if you do not have an HTTPS site. Google, in addition to other web browsers like Internet Explorer and Firefox, favor secure, encrypted HTTPS websites over HTTP sites. Luckily, Google has made it easy for developers to set up and migrate existing sites to secure HTTPS. Developers like Market3 have been transitioning sites to HTTPS since this news broken and creating new websites as HTTPS. According to a blog post by Google, “Over 68% of Chrome traffic on both Android and Windows is now protected,” and “Over 78% of Chrome traffic on both Chrome OS and Mac is now protected.” It’s important to note 81 of the top 100 sites on the web use HTTPS by default. The word “Secure” with a green padlock next to the URL means the site is using an HTTPS. This means the information you are sharing is private and protected. If you see “Info” or “Not Secure” with an info icon, it means the website is not using a private connection and someone could see your information. If you see “Not Secure” or “Dangerous” with a red triangle, you should proceed with caution or avoid using the website completely. This site has been flagged as unsafe by Safe Browsing and will likely put your information at risk.